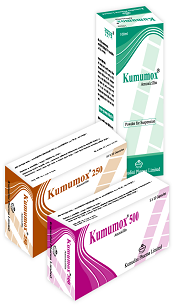 Kumumox (Amoxicillin) is a broad spectrum semi-synthetic penicillin with bactericidal activity against a large number of gram-positive and gram-negative micro-organisms. Respiratory tract and E.N.T infections : Acute and chronic bronchitis, pneumonia, tonsilitis, pharyngitis, laryngitis, sinusitis and otitis media. Urinary tract infections : Pyelonephritis, cystitis and urethritis. Obstetrics and Gynaecological infections : Intra-abdominal sepsis, puerperal sepsis, septic abortion and bacteriuria in pregnancy. Kumumox (Amoxicillin) may be used prophylactically in patients with high risk of developing endocarditis after surgical procedures. Therapy with Kumumox (Amoxicillin) may be instituted prior to obtaining results from bacteriological and susceptibility studies to identify the causative organisms and its susceptibility to Amoxicillin. Unless otherwise prescribed by the physician, the following dosage is recommended. Adults: 500 mg (i.e. 1 capsule or 4 teaspoonful suspension) 8 hourly in severe infection. Normally 250 mg or 2 teaspoonfuls suspension 8 hourly. Up to 2 Years : 62.5 mg ( 1/2 teaspoonful) 8 hourly. In severe infections the dose may be doubled. Adults : 4g per day in divided doses for 14-21 days. Children : 100 mg/kg/day in divided doses for 14-21 days. Gonorrhoea : 3g as a single dose. Syphilis : Depending on serological reactions and type of disease, 250mg 6 hourly for 1-5 months. Simple acute urinary tract infection : Two doses of 3g each separated by an interval of 10-12 hours. The excretion of the antibiotic may be delayed due to renal impairment. In such cases, it may be necessary to reduce the total daily dosage depending on the degree of impairment. The side effects are usually mild and transitory. They may include diarrhoea, indigestion and occasionally urticarial or erythematous rash. As with any potent drug, periodic assessment of renal, hepatic and hematopoietic functions should be made during prolonged therapy. The possibility of super-infections with mycotic or bacterial pathogens should be kept in mind during therapy. If super-infections occur (usually involving Enterobacter, Pseudomonas or Candida), the drug should be discontinued and/or appropriate therapy should be instituted. Kumumox (Amoxicillin) is contraindicated in patients hypersensitive to penicillins. Amoxicillin must not be used in patients with glandular fever. Concurrent administration of probenecid delays the excretion of amoxycillin. Store in a cool and dry place away from light and moisture. Keep out of the reach of children. Kumumox Powder for Suspension should be reconstituted immediately before use and after reconstitution should be kept in cool place, if possible in a refrigerator. The reconstituted suspension should be used within 5 days if kept at room temperature or within 7 days if kept in refrigerator.